Lionel Brockman Richie, Jr. : American R & B singer, songwriter and occasional actor. Born June 20, 1949, in Tuskegee, Alabama, United States. 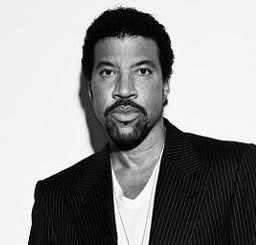 Lionel Richie began his career as a singer in the group Commodores in the 1970s then began a solo career and was an immediate success and became one of the essential voices of American music soul. (See more) He composes and sings essential tracks like "Hello", "All Night Long" or "Say you say me". It works with other international artists such as Michael Jackson, the Alabama, Tina Turner group, Kenny Rogers, Shania Twain, Chimene Badi. The winners of the singer is impressive: nearly 100 million albums sold, 20 of its securities classified in the Top 10, five Grammy Awards, an Oscar, a Golden Globe, 10 American Music Awards or six People's Choice Awards! Motown 1698 1983 "Wandering stranger"